Cows are sacred in Hinduism, India’s most populous religion. They’re left to roam the street. I saw several in this area of central Bangalore but had a challenge composing a worthy angle. I finally hit upon a profile that happen to mimic the front of a tuk tuk, India’s ubiquitous three-wheeled vehicle. Because of the special status of cows, you rarely see beef served in India. Even McDonald’s doesn’t sell beef hamburgers in India. The tuk tuk, officially called an auto rickshaw, is commonly referred to in India as an auto. I love these vehicles. I think they perfectly fit the congested, relatively slow-moving roads and are particularly suited for the city. 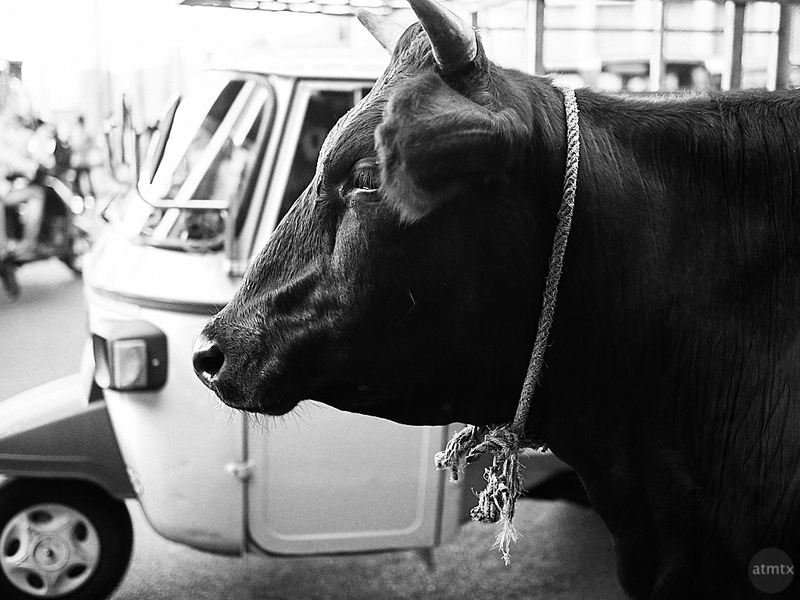 I would have never thought to juxtapose the face of a cow and the face of an auto, but I just happen to see this. Photographic serendipity strikes again.